Far from cheap, not always readily available and sometimes difficult to keep, aquarists just love those suckermouthed plecos. Here are some of the species that breeders and collectors adore. Prepare to pay £100 or more for a juvenile Zebra plec. Scientific name: Hypancistrus zebra (High-pan-sis-truss zeb-ra). Origin: Endemic to the Rio Xingu, Brazil. Tank size: Minimum 60 x 30cm/24 x 12in. Water chemistry: Soft acidic to slightly base water; pH 6.0–7.5, hardness 2–16°H. Feeding: Carnivorous fish that enjoys bloodworms, brine shrimp and even Daphnia. Notes: Despite being threatened by dam construction, wild caught fish offered in the UK may well have been illegally caught and smuggled out via other countries. Tank bred/farmed fish are available and completely legal. Scientific name: Baryancistrus xanthellus (Barry-an-sis-truss zan-thel-us). Origin: Rio Xingu and Iriri, Brazil. Tank size: Minimum 120 x 45cm/48 x 18in. Water chemistry: Slightly acidic to slightly base; pH 6.4–7.6, hardness 2–14°H. Feeding: Omnivore eating some algae and inverts. Offer Repashy gel foods. Notes: Territorial with other cats, aggressive with other nuggets. Will leave plants alone in a planted layout. Scientific name: Scobinancistrus aureatus (Scoh-bin-an-sis-truss or-ee-ate-us). Tank size: 180 x 60cm/60 x 24in. Water chemistry: Soft acidic to neutral water; pH 5.8–7.2, hardness 2–14°H. Feeding: Omnivore, offer prawns, mussels and fish pieces, as well as fruit and veg with the skin on. Notes: Big and robust, and retains gorgeous markings into adulthood. Excellent in a tank with other large fish such as South American cichlids. The Blue phantom is a more peaceful species of plec. Scientific name: Hemiancistrus sp. L128 (Hem-ee-an-sis-truss). Tank size: 120 x 30cm/48 x 12in. Water chemistry: Soft acidic to neutral water; pH 6.0–7.0, hardness 2–12°H. Feeding: Omnivore, offer tablets, gel foods, vegetables and frozen bloodworm. Notes: Works surprisingly well in a peaceful, slightly acidic community tank, though can take a while to acclimate to a new set-up. Scientific name: Panaque nigrolineatus (Pan-ak-ay nig-row-lin-ee-ah-tuss). Origin: Colombia, Venezuela, South Central Amazon Basin. Water chemistry: Slightly acidic to slightly alkaline; pH 6.5–7.5, hardness 4–15°H. Feeding: Veg, veg and more veg. Offer greens, peas, and fruit. Ensure there’s wood in the tank for them to graze on. Notes: There are many varieties with subtle differences between them. Whichever one you get, expect someone to dispute its identity. Scientific name: Panaqolus albivermis (Pan-ak-ay al-bee-verm-iss). Tank size: 90 x 30cm/36 x 12in. Water chemistry: Acidic to alkaline water; pH 6.6–8.4, hardness 4–18°H. Feeding: Xylivore (wood eater), ensure wood is always present in tanks, along with offered vegetable fare. Notes: Frequently misfed, these plecs go very well in a set-up with South American tetra, but they can become more territorial as they mature. Scientific name: Panaque cf. cochliodon (Pan-ak-ay cok-lee-oh-don). Origin: Magdalena and Cauca basins, Colombia. Water chemistry: Soft, acidic to neutral water; pH 6.0–7.4, 4–14°H. Feeding: Xylivore (wood eater), ensure wood is always present in tanks, along with offered vegetable fare and occasional meaty treats like prawn. of people to ever see these fish in the flesh. Scientific name: Hypancistrus sp. L066 (High-pan-sis-truss). Water chemistry: Very soft acidic to neutral water; pH 5.8–6.9, hardness 2-8°H. Feeding: Carnivorous, offer plenty of bloodworm and prawn, as well as carnivore tablets and pellets. Notes: Prone to being confused with other species, you get a very pleasant fish for not too absurd a price. A real keeper. Scientific name: Baryancistrus chrysolomus (Barry-an-sis-truss cry-so-low-muss). Tank size: 120 x 45cm/48 x 18in. Feeding: Omnivore, ensure algae growth but add veg like courgette and sweet potato. Notes: Juveniles tend to be more contrasted than the adults. The Zebra plec: Learn your stripes! 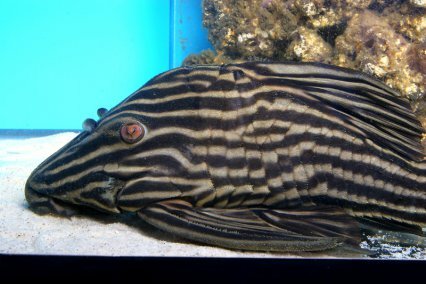 Most fishkeepers consider keeping Zebra plecs and many would like to breed them. But whatever your goal, you'll need to know to look after them, says Julian Dignall. 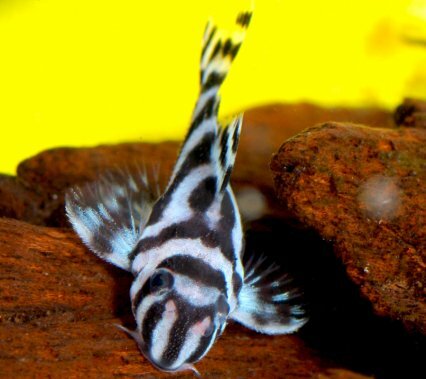 The only thing black and white about the Zebra plec is its beautiful markings. Pretty much everything else is subject to myth, opinion and misinformation. Depending on whom you speak to, the Zebra plec was discovered by anglers somewhere between the mid 1970s and 80s. It was given an L-number, L046, in 1989. 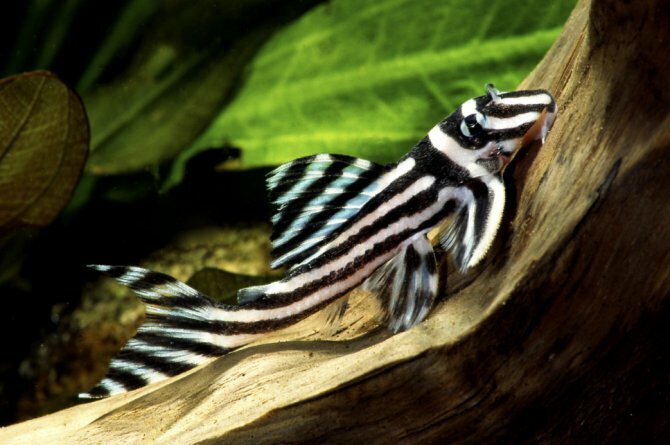 The stripes of the Zebra have come to represent a new wave of catfish keepers, and it’s a flagship species for the now undeniable fishkeeping tribe that are L-number keepers and breeders. 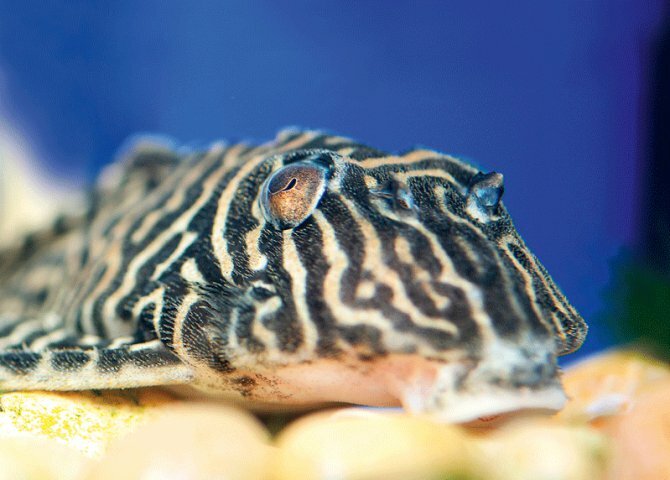 The Zebra plec is endemic to the middle of Brazil’s Rio Xingu (pronounced sheen goo) and is among the catfish species at risk from the Belo Monte dam. It lives at a depth where the surroundings are, at best, pretty gloomy, if not completely dark. It lives in the cracks, gaps and natural caves found in the very specific type of rock found in the river. This is dark brown to black hard igneous rock that, in shallower water, is set in tan-coloured sand. There is very little submerged wood, there are virtually no plants and the water belts through the area at a rate of knots. Many of these areas are rapids and the water is highly oxygenated. Exports of tropical fish from Brazil are governed and policed by the Brazilian Institute of Environment and Renewable Natural Resources (IBAMA). IBAMA produces a so-called positive list of fish species and those are the ones that may be collected and exported into the global ornamental fish trade. Hypancistrus zebra has not yet appeared on it and is illegal to export from Brazil. When you encounter one for sale it will either be captive-bred or will have been smuggled out of Brazil and exported, typically, from Colombia. They range from around £95-£150. This activity, as you may imagine, stirs some debate among fishkeepers. Even if such a wonderful species is at risk of extinction in the wild, does that make it acceptable to fund the smuggling of them into our shops? That’s to say, 'rescue' them before they are wiped out. Thankfully, the Zebra plec’s future looks a bit brighter than many of its Xingu river cohorts. Because of its small size, relative ease of breeding and status, it is bred and traded in most countries that have a decent aquarium hobby. Keeping Hypancistrus zebra is straightforward, especially with captive-bred stock. When this species was first being bred in aquaria, arguments raged over how to best keep and breed it. Some polarised views were initially stated, but it turns out most folks were right, even if they had different points of view, because this species can live in a range of water conditions. So, the hard water proponent was no more right or wrong than their softer water advocate. It has been bred in really quite hard water with no ill effects, though most spawns are in about pH 6.5-7 with moderate to no hardness. I accept that breeding fish isn’t everyone’s cup of tea. It’s not a view I subscribe to personally, but I get the fact that people just want to look at their fish rather than reproduce them. However, in the case of the Zebra plec the majority do wish to breed them. Provide warm, oxygenated and clean water. Aim for a neutral pH, a water temperature of 86-88°F/30-31°C and have at least two power-driven filter outlets that mix in atmospheric air with the water flow. Clean water means both a decent power filter and at least 25% water changes. Consider using plants and bogwood to replicate the natural habitat. Feeding is more a matter of physics than biology. Zebras are not large plecs and you can keep a group in a relatively small tank. However, with all that filtration in play (see box above, right) food can get blasted around the tank and filtered away before the fish get to eat. This is where some trial and error with aquascaping comes in. Play around with rocks so that there are some open areas of gravel where food collects. Even better would be near caves. If you can, do this in such a way as it’s easily accessible. It may sound obvious, but be really careful moving rocks around with plecs in the tank. It is easy to trap or squash them, especially if you are stretching or off balance. Aim for an aquarium that allows food to sink to quiet pockets away from the current, where the plecs can feed over a ten to 15 minute period once or twice a day. The choice of food is important. Flake or floating foods won’t do well in that kind of current, so sinking tablets made from flake or algae tabs will work, but Zebras need a lot of protein. I favour discus food, either frozen or granular. Select one that doesn’t expand a lot once placed in water. Many plecs will gorge on whatever food is available and something that expands to twice its size after being submerged for five minutes is remarkably lethal. This is especially true in plecs, as two thirds of their bodies are covered by rigid plates, so the only way the stomach can expand is downwards where there is only exposed skin. The temptation to keep Zebras with discus is strong, as they share water requirements and similar diets. But the issue of water current can be overlooked. If you’ve got a filter that provides lots of dissolved oxygen (but without the kind of current that would scatter the discus around the tank), then this might work but it’s a bit hit or miss. If you’ve a central system, then keeping Zebras in one tank and discus in another in the same system would work well, as you can add a pump/filter to the Zebra tank to create the extra current, but I’d suggest keeping these two fish apart in the main. I like to keep plecs in oversized tanks because it means I have a lot more flexibility when it comes to looking after their water. For example, I have a group of five Zebra plecs breeding in a tank that has a 91 x 46cm/36 x 18" footprint and is 38cm/15" high. In this is 2mm bore gravel to a depth of about 1". I mix black and brown gravel to get a look that I like and it appears the Zebras are, at least, not objectionable to. The black and white fish look fantastic against what is not only attractive, but reasonably natural substrate. On top of this, I have lots of breeding cave pipes and then slate and lateritic holey rock. Zebra plecs won’t breed unless caves are present. These are commercially available or you can make your own. As a rule of thumb, I put two caves in for every adult fish. This is seen by some as overkill: some authors have one cave. However, I note a lot of aggression over caves and the alpha male will always pick the one that suits him best. So, if there are others available, the fighting is toned down a bit and, like me, you might be lucky and get two pairs spawning. This is relatively unusual, and it’s more common for males to breed with more than one female, a few weeks apart, but in the same cave. Females will live near the male’s cave, and so I like to provide rock cover over the caves that are thus in shade. The temptation is to have them in full view so you can monitor proceedings, but it’s more important to have the cave mouth perpendicular to the current and for all the adult fish in the tank to be able to come and go from their places of rest without too much aggro. Get the décor wrong and adult male Hypancistrus can seriously injure and kill each other. However, many people buy captive-bred Zebra plecs and they tend to be a bit smaller and not yet mature. Thus, such aggression has yet to manifest itself and can be avoided altogether by adding refuges as the fish begin to mature. In well-conditioned, mature fish, sexing is straightforward. Applying these observations to fish less than about 80mm SL or that have not been in captivity for long will give variable results. 1. Full-grown male Zebro plecs are about 10-15% larger and bulkier than females. 2. The male’s interopercular odontodes that have grown from the fish’s cheek under the eye are longer — more than two times the width of the eye. 3. The male’s leading pectoral fin spine has orange-tipped odontodal growth of a similar thickness, if not length, to the cheek spines. 4. Males have heavy-set heads. 5. When viewed from above, males have a straight line from the base of the pectoral fin spine to the caudal peduncle. 6. Flip them over and examine their pinky-white undersides: males have pointier bullet-shaped genital papillae. 7. Females are generally slighter. 8. While females develop cheek and pectoral fin spines with maturity, they are shorter and less noticeable than the males’. 9. Females have a convex, curved outline from the base of their pectoral fin spine to the caudal peduncle (broadest in the midriff where eggs will be developed). 10. Underneath, females have a much less defined, but broadened genital papillae. Much debate surrounds spawning triggers. Some authors report that not cleaning the filter — therefore slowing the water current a little — along with skipping a water change or two followed by increased water changes triggers well-conditioned pairs to spawn. Many say they will start spawning when mature given good water conditions. Certainly once they do start they will continue for years. Often the first batch of yellowish orange eggs will be infertile and not hatch. This commonly happens with many plec first timers. It’s just a sign to keep doing what you’ve been doing — within a month, they will try again, maybe sooner. The male will normally guard the eggs in the cave and often the first an aquarist knows they’ve bred is on seeing some delightful mini Zebras scooting around the tank, typically under stones. If disturbed or inexperienced, the male may displace the eggs out from the cave. In this situation, or where you want to micro manage the eggs hatching, then an in-tank nursery is required. This can be a net mesh box or a more sophisticated plastic box, but the important things are that it shares water from the parent tank and is easy to clean. Place an airstone close to the egg clutch to simulate the fanning of the male’s fins in the cave. When they hatch, youngsters will have unfeasibly large yolk sacs. It is only when these are consumed that you should start feeding. Crush whatever you’re feeding the adults and consider sinking tablets too. They are not hard to feed and even at this small size will eat dry foods eagerly and regularly. For best results try to feed twice a day or more. Clean the nursery at least daily, it needs to sparkle. However, I prefer the hands-on dad approach and Zebra plec dads do a great job of getting 20 or so youngsters out of the cave. At this size they will forage and eat with the adults. They’re slow growers and unless you pay them a lot of attention in terms of feeding, space and water quality, getting them to grow more than 1cm every 6-8 weeks will be a challenge. Zebra plecs are now bred in commercial numbers and these turn out beautiful clean fish in number. Also, shipments of wild-caught fish tend to have more males than females (it’s easier to collect males from the wild as they tend to be in a cave), but with captive-bred fish, it is more like parity. Because these are high-end fish, professional breeders know they must be kept in high quality surroundings to ensure they grow on well and fast. Zebra plecs produce about 20 eggs and spawn every couple of months. These figures can be improved a little with ultra-attentive care but serve as a good indication. So, one pair could produce about 120 offspring a year. Let’s call that 100 once you take into account culling of inferior fish and the odd accidental loss for whatever reason. Now you need another year to bring them on. That’s running, say, eight tanks for two years before you start selling them. That can be done, but selling them in twos and threes to private buyers isn’t going to fund that Porsche anytime soon. To make it a business, you’re going to need, say, 100 pairs and several hundred tanks — most of which you’ll be running for a year or two before any selling occurs. Bear in mind that a £100 retail fish might wholesale at about £40 and you don’t make any margin on shipping. Then factor in shipping disasters and so on. At some point in time, heat and food makes it more viable to attempt such an endeavour in a tropical country rather than in chilly old Blighty — unless you really scale up the operation or transport costs rocket. This is the model being utilised by specialist commercial breeders and I think that given the beauty of the Zebra plec, will ultimately mean we continue to see this species offered for sale irrespective of what man-made catastrophe may, or may not, befall its wild cousins. This is also why I mention breeding this species for yourself. You can get to the stage where you and a group of friends have a decent population of these things and can trade with other groups. Isn’t that a good thing? these wonderful black and white rock star plecs remains, you’ll be able to give it a worthwhile go and do it in a planned manner. Then you can dream of that first sight of baby Zebra plecs in your tank. That experience is a special thing. Pronunciation: Hype an siss truss. Spawning age: Around three years. Plecs — it's all in the mouth! The mouths of loricariids are an evolutionary marvel, says Dr Michael Hardman. And they can tell us so much about the diets of the different suckermouth catfish species we keep. Their mouths are an evolutionary marvel. They must provide a firm attachment to an irregular surface in fast flowing water — and do this without forming a perfect seal because they still have to breathe! They also have to taste the surface and scrape, dig, manipulate and pass backwards food that include detritus, algae, insect larvae, seeds, macrophytes, sponges, snails, worms, clams and even wood. They also have to settle territorial disputes, dig holes, claim mates and carry or clean a clutch of eggs. Ask an ichthyologist what suckermouths eat and, if they have checked the stomach contents of museum specimens, they will usually answer ”brown mush”. Because most suckermouths have combs of fine teeth, for when they scrape or brush food into their mouths it becomes very difficult to make out what it was beforehand. One line of research relies on analysis of suckermouth tissues. When food is digested and becomes part of the animal, its chemical signature is incorporated. Different foods leave different signatures and by measuring their proportions we can work out what the animal has been feeding on. Fishkeepers quickly figured out that many of the striking suckermouths first seen in the 1990s needed a more meaty diet than bristle-nosed relatives. Diversity in diet seemed matched by a diversity in mouth morphology. Yet how far does this match go? Can we look at a mouth and know what its owner eats? To a large extent, yes. Suckermouths have very different jaws to humans. They don’t have mobile tongues and their jaws are not attached to the skull. Their jaws sit in a ring of flexible but tough connective tissue that keeps them from dislocating while giving them freedom of movement. Many suckermouths are generalist feeders and their mouth must handle items that pose different problems. Those such as Pterygoplichthys and Ancistrus are generalists, having moderate-sized jaws filled with numerous fine teeth. The jaw muscles contract to scrape soft foods such as algae, biofilm, fruits and soft seeds. Generalists can scrape decomposing wood or handle small shrimp or aquatic insect larvae, so it’s not uncommon to see Ancistrus rasping bogwood in the community aquarium. Generalists also quickly adapt to taking flake and tablet foods. South American freshwater fishes have evolved to fill an ecological niche that in the northern hemisphere is filled by insects; detritivory. Feeding on detritus has been perfected by curimatids (Prochilodus) but suckermouths such as Rineloricaria have capitalised on this resource too. Higher animals such as suckermouth catfishes can’t digest cellulose in detritus, but can handle the fungi and bacteria that live on it. So feeding on decomposing detritus is like us eating a sponge soaked in chicken soup. Detritivores typically have lightly built jaws with a few strong teeth for scraping, rolling and chopping their food into swallowable pieces. As the Andean mountains began to rise, high gradient streams began to form in which few fishes had the nerve or equipment to spend any time. As such, these were virtually predator free and prime real estate for small catfishes. Enter the bulldog plecs (Chaetostoma). These have run riot with the sucking feature of their mouths by developing huge lips. Their jaws have become broad and filled with hundreds of fine teeth, perfect for brushing algae in a crashing stream. Unfortunately, they rarely thrive in captivity because home aquaria typically don’t grow enough algae. I’ve got round this by blending hot spinach, broccoli, peas and shrimpmeat with boiling agar. I coat pebbles or make cubes with the agar paste while still molten and place them in the fridge or freezer until needed. Many fancy suckermouths in the hobby hail from north-flowing tributaries of the Amazon of north-eastern Brazil. Algae doesn’t grow well in these nutrient-poor systems, so most plecs that live there have found alternative ways to make a living. One of the most common has plugged into aquatic insect larvae. Several species of Hypancistrus and other small, brightly patterned plecs have been collected with stomachs bulging with mosquito and stonefly larvae. These are attached to surfaces in clean, clear water so evolution has placed them squarely on the suckermouths’ dinner plate. Suckermouths specialising in aquatic insect larvae have neat, small mouths with a few strong teeth. What’s more, they rarely exceed 10cm/4” because they need to access the tight places where they find their prey. In those same streams of low algal productivity, suckermouths exist that are capable of handling more sizeable prey than larvae. The vampire plecs (Leporacanthicus) have long and narrow upper jaws that contain a few chisel-like teeth. The lower jaw is broad, heavily reinforced and contains three to five shorter and more robust teeth. Similarly, Scobinancistrus, believed a close relative of Panaque, has strong jaws with spoon-shaped teeth to crack open or winkle out meaty foods from protective shells. One group of suckermouths are the bane of external filters everywhere — the wood feeders. Suckermouths such as Panaque and Panaqolus have short, reinforced jaws set in a diamond shape that bear several strong spoon-shaped teeth. Fishkeepers have long known the importance of wood in the suckermouth aquarium, but only recently have researchers tried to test whether it is the main source of nutrition or just incidentally ingested. In the animal kingdom, only insects have really managed to digest cellulose and lignin — the main components of wood — and only with the aid of some special animals that live in their guts. Results suggest that Panaque, although it eats a lot of wood, obtains little if anything from it. Possibly, by scraping deeper into the material, more decomposing fungi or biofilm is ingested. So feed your wood eaters more than a lump of bogwood. Loricariid jaws are incredibly variable, with almost every species having a different configuration. Specifics of the jaw typically correspond to the preferred food and a close look can often give the aquarist clues about what to feed a new plec. Baryancistrus (above) is a classic generalist. With multi-purpose jaws filled with fine but tough teeth, these suckermouths can handle anything from bogwood to boiled spinach. The award for weirdest mouth surely goes to Planiloricaria cryptodon (pictured above). This species lives deep in the Peruvian Amazon and its fimbriate mouth with almost no teeth is specialised for detecting and inhaling invertebrates. Add extra foods, medicines or supplements to a suckermouth diet by blending them with a preferred food and then using molten agar to bind them together before feeding.